How do I calculate the probabilities for wild card contenders to advance? For my model, I take those scores as roughly representative of what might happen in a given tournament. Using those numbers, it’s just a matter of calculating the probability that a given score gets bumped off the leaderboard. In this post, we’ll look at the situation after the second quarterfinal of the most recent Tournament of Champions, won by Alex Jacob. For those who have already played, I’m including the percentage of past non-winning ToC scores that finished below their totals. Note that I do not include the winners of future quarterfinals. In any given game, at most two players will have a shot at a wild card; I’m using the faces you see here to make the examples easier to follow. After two games, Greg Seroka sat in the fourth position. His total of 11,500 was better than 71% of all past non-winning scores. As I noted at the time, 11,500 is unusually high for that spot with so many games yet to be played; the cut-off in the 2014 ToC, after all, was 9,100. The odds are 71% x 71% x 71% x 71% x 71% x 71%, or 0.716. That’s about a 12.8% chance of surviving. *Yes, a fifth wild-card slot will open up if a QF ends with no winner. That possibility has almost no effect on these calculations. The higher positions are harder to calculate, because there are more ways that can work out in those players’ favor. Let’s consider the third-place position, held by Kristin Sausville. She had 12,800, better than 78% of past non-winning scores. What is the probability none of the remaining players beats her? Not so great, either. But Kristin has a bit more wiggle room than Greg: it’s fine if one non-winner beats her score. So we need to find a way to calculate that. That’s six different possibilities. What is the probability of each? I’ll make a table to make this more visual. Each of these combinations has a 6.35% chance of occurring. When we want to calculate the probability that ANY combination happens, we add the probabilities together. Thus, using our assumptions, there is a 38.1% chance – six times 6.35% – that one and only one remaining player will pass Kristin’s score. Let’s keep rolling. In second place after two quarterfinals was Dan Feitel, whose score of 14,000 was better than 82% of all non-winning scores, historically. Already, Dan has around a 70% chance of advancing. But he’ll also advance if exactly two players pass him. How do we calculate the odds that this takes place? Let’s line these up and see if there’s a pattern. This looks promising: the exponents for the “worse” and “better” probabilities always add up to six, because all future players must finish either worse or better than our chosen player. Have you figured out how we populate the “combinations” column? That’s right: in every case, we’re finding a “combination of n choose k” possibilities, where n is the total number of players remaining (six), and k is the number of players who finish higher than Dan in that particular scenario. 0! x (6-0)! 1 x 6! 1! x (6-1)! 1 x 5! 5! 5! x (6-5)! 5! x 1 5! …which is exactly the same as 6C1 (six choose one), the number of combinations in which exactly one player finishes higher. Time to put to work what you’ve learned so far. After QF #2, Vaughn Winchell led the wild card pack with 16,599, a total higher than 95% of past non-winning scores. Compared with Dan, Vaughn has one additional fallback to still qualify for the next round: if exactly three of the remaining non-winning players finish with a higher score. Even without this option, Vaughn already has a 99.8% chance of moving on. But what should I put in the green cells to make this complete? First, we need to calculate the number of combinations of three players finishing higher than Vaughn. 3! x (6-3)! 3! x 3! 6 x 3! Now, we plug that in. There’s a 0.2% probability that exactly three remaining non-winners pass Vaughn. I’d never say that a player who hasn’t yet clinched a wild-card spot has a 100% chance of doing so – there’s always a possibility he’ll get bumped – but this is pretty much a lock. If you’re interested in another, try this: in the 2004 Tournament of Champions, I sat in third place on the wild-card standings after 3 quarterfinal matches (meaning there were four players remaining who could beat me). Assuming a player has a 40% chance of finishing below my score of 3,500, what were the odds that I’d advance? I’ll fill out the other slots just to show that all of the possibilities add up to 100%. Note that we need to calculate a different number of combinations for each possibility, because there are only 4 players left! This model comes with some issues, of course. Non-winning scores are not consistent from tournament to tournament; the strength of competitors and the difficulty of material vary widely. 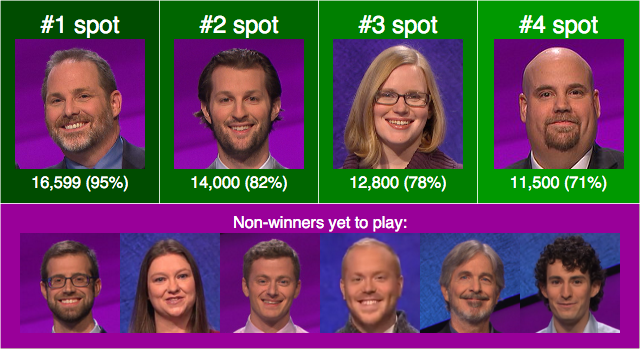 Second, as I’ve pointed out in the past, Final Jeopardy! plays an outsized factor in determining wild cards, and there is probably an underlying correlation missing from the math above. The Final clue in this year’s QF #4 played much, much easier than the others, for example; Elliot Yates, however, didn’t have enough money to make anything of it. Because the assignment of FJ! clues is random, I feel safe in ignoring any effects from the vagaries of their difficulty. In my concluding post in this series – which I’ll certainly publish before the College Championship tapes in the new year – I’ll share the model behind my Wild Card Wagering Calculator (WC2), which takes into account your confidence level in the category.